MEDICAL FAIR INDIA is India’s no. 1 exhibition and conference for healthcare, which act as a platform where connections are made and business relationships are nurtured. With participation from over 20 countries, MEDICAL FAIR INDIA provides an opportunity to position your brand among competitors and further increase your level of visibility. MEDICAL FAIR INDIA is well known for its ability to detect trends and respond to market impulse. Find diverse solutions to your diverse healthcare needs. Explore how the latest digital technologies and new approaches shaping healthcare. Business: MEDICAL FAIR INDIA is India’s no. 1 exhibition and conference for healthcare, which act as a platform where connections are made and business relationships are nurtured. Positioning: With participation from over 20 countries, MEDICAL FAIR INDIA provides an opportunity to position your brand among competitors and further increase your level of visibility. 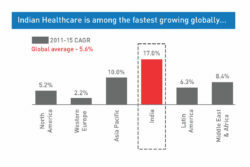 Trends: MEDICAL FAIR INDIA is well known for its ability to detect trends and respond to market impulse. Innovations: Explore how the latest digital technologies and new approaches shaping healthcare. Solutions: Find diverse solutions to your diverse healthcare needs. The new application forms will be available soon. Big Data, Artificial Intelligence, Mobile, Information technology– this is what Future For Health is all about. Medical Fair India organizes a Two Day conference with Voice of Healthcare as conference partner. In order to react to the current visitor requirements and India's demographic development, there will be for the first time a special area on the topic of rehabilitation at MEDICAL FAIR INDIA 2019. Messe Düsseldorf India has acquired the FAMDENT Shows, one of the leading Indian trade events for dental medicine. This means the event will become a member of the MEDICAlliance, the umbrella brand for all global healthcare exhibition activities of the Messe Düsseldorf Group. A corresponding agreement was signed by Thomas Schlitt, Managing Director of Messe Düsseldorf India Pvt. Ltd., and Dr. Anil Arora and Dr. Jyotika Arora, the organisers of the FAMDENT Shows. MEDICAL FAIR INDIA is member of MEDICAlliance.